The most important forest pests in our area are the Gypsy Moth, Emerald Ash Borer, Hemlock Wooly Adelgid, and Beech Bark Disease. (Like the Chestnut blight, these pests and diseases are all imported culprits.) Of these 4, the Gypsy moth probably causes the greatest dollar loss, and is the most amenable to large scale control. The Gypsy moth is potentially the most destructive forest pest to threaten the mid-Atlantic states since the chestnut blight killed all of the American chestnut in the early part of the 20th century. Since its inadvertent introduction into Massachusetts in 1869, it has spread throughout the Northeast and is now present throughout all of the East Coast states. The pest goes through population cycles where it builds up over a period of years, peaks and then crashes. In the piedmont and coastal plain regions it generally is spotty, affecting some woodland and not others. 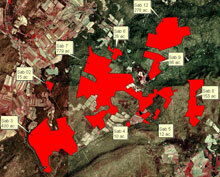 In the mountains it can reach devastating levels and defoliate thousands of acres in one season. 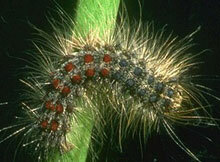 The Gypsy Moth does all of its damage in the larvae stage of its development. The moth lays its eggs in the summer preceding defoliation. The egg masses are very visible in the winter months. They are light tan and about the size of your thumb nail. Each egg mass contain thousands of eggs. They are usually found on the under side of tree limbs, in bark crevasses, or under debris such as firewood piles, junk cars and the eaves of buildings. From mid April to early May the eggs hatch releasing tiny larvae. This usually coincides with the emergence of the oak leaves. The larvae go through four development stages. During each stage they are feeding on the newly emerging leaves. In the fourth stage of development the larvae are up to two inches in length and show the characteristic blue and red dots on their back. It is during this stage that the most severe defoliation occurs. Oak species are their favorite food. It is the presence of oaks that determines the location and severity of the Gypsy Moth outbreak. In late June or early July the larvae pupate, shortly after the male and female moths emerge to mate and lay their eggs. By far the most preferred species for the Gypsy Moth to feed on are the oaks. Red, Black, White, Scarlet and Chestnut Oak are all susceptible to defoliation from the larvae. In stands with 50% or more oak stocking severe defoliation is possible. Two concepts that woodland owners should understand are stand susceptibility to defoliation and stand vulnerability to mortality. Any oak dominated forest is susceptible to defoliation. There are only two methods to respond to a current or predicted Gypsy Moth outbreak. One is to take direct chemical action in the form of aerial spraying. The other is to perform cultural treatments to improve the health and composition of your forest. This usually involves thinning your woodlot before any defoliation occurs. If severe defoliation has already occurred some tree mortality is likely and the only option then is to harvest the dead and dying trees, as soon as possible. Parkton Woodland Services can evaluate your woodland to determine its susceptibility to defoliation and work with you to determine the best approach to take. For the past several years we have been working with aerial applicators to spray private lands in Frederick County, Maryland. We will work with you to arrange for an applicator to spray your property. This involves location of the spray block with a GPS unit; selection of the chemical to use; contracting for the services and oversight of the actual spray operation. Spraying can be very effective and timely if it is done correctly. It should only be done by professionals and need not be done on stands that are not susceptible to defoliation (not dominated by oak species). There are several States which will cost share part of the expense of spraying if your land qualifies. Otherwise there are numerous private air services that will spray large ownerships. Map of gypsy moth spray blocks which is downloaded to helicopter NAV system for spraying.